The reform of the European Constitution continues to dominate news headlines and has provoked a massive debate, unprecedented in the history of EU law. Against this backdrop Monica Claes' book offers a "bottom up" view of how the Constitution might work, taking the viewpoint of the national courts as her starting point, and at the same time returning to fundamental principles in order to interrogate the myths of Community law. Adopting a broad, comparative approach, she analyses the basic doctrines of Community law from both national constitutional perspectives as well as the more usual European perspective. It is only by combining the perspectives of the EU and national constitutions, she argues, that a complete picture can be obtained, and a solid theoretical base (constitutional pluralism) developed. Her comparative analysis encompasses the law in France, Belgium, Denmark, the Netherlands, Germany, Ireland, Italy and the United Kingdom and in the course of her inquiry discusses a wide variety of prominent problems. 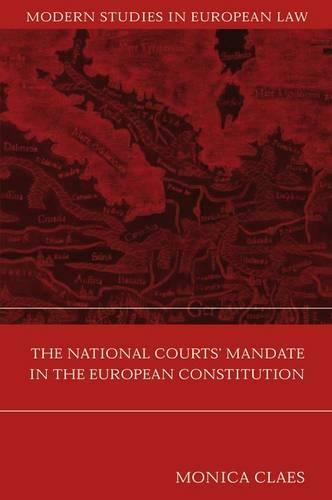 The book is structured around three main themes, coinciding with three periods in the development of the judicial dialogue between the ECJ and the national courts. The first focuses on the ordinary non-constitutional national courts and how they have successfully adapted to the mandates developed by the ECJ in Simmenthal and Francovich. The second examines the constitutional and other review courts and discusses the gradual transformation of the ECJ into a constitutional court, and its relationship to the national constitutional courts. The contrast is marked; these courts are not specifically empowered by the case law of the ECJ and have reacted quite differently to the message from Luxembourg, leaving them apparently on collision course with the ECJ in the areas of judicial Kompetenz Kompetenz and fundamental rights. The third theme reprises the first two and places them in the context of the current debate on the Constitution for Europe and the Convention, taking the perspective of the national courts as the starting point for a wide-ranging examination of EU's constitutional fundamentals. In so doing it argues that the new Constitution must accommodate the national perspective if it is to prove effective.